The Gear Keeper Retractable Smart Phone Keeper which will give you peace of mind that your smart phone is safe and there when you need it. Featuring a retractable, super-compact design and simple functionality, it allows you to stay focused on the task at hand. The Gear has a low force 40-pound break-strength industrial retractor made from a high tensile spectra/nylon line. The line extends to 36 inches and quietly retracts, zipping back into place. This simple yet amazing device is made to prevent your phone from hitting the ground, becoming lost or damaged and has been specifically designed to operate in saltwater environments. 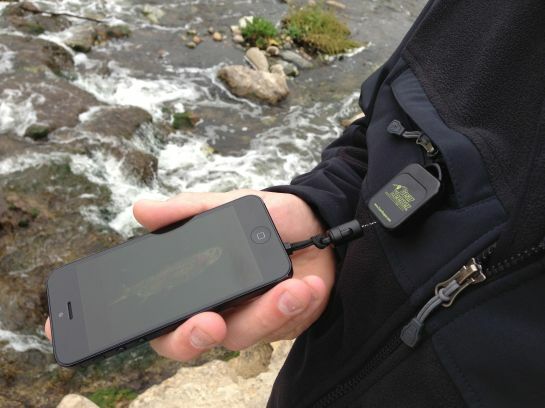 Attaching the device is anything but complicated with multiple mounting systems including a snap clip to D-ring or an SS threaded stud to secure inside a pocket or to your fishing vest. A pad-eye phone fastener with heavy duty adhesive safely joins the phone to the Retractable Smart Phone Keeper. An easy to use iPhone adapter (excluding iPhone 5) is also included for a quick connect/disconnect. Finally, the Q/C disconnect system can be easily detached from the Gear Keeper for extended talk times, obtaining the latest updates from apps or when it's not needed. The original Geer Keeper system was engineered specifically for SCUBA diving literally born out of a need to secure items in situations when hands are otherwise occupied. Gear Keeper systems are now available in countless configuration options and used in a wide range of applications from fishing, snowsports and hiking to law enforcement, the military and trucking.